Simple handling application and limited space in the control cabinet? 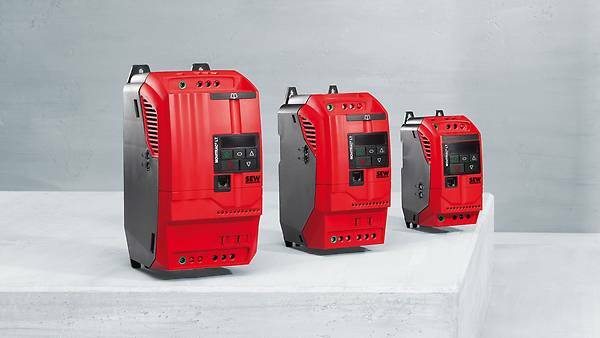 Perfect conditions for our MOTVITRAC® LTE-B frequency inverters in IP20. Their compact design and range of functions make them ideally suited for controlling the speed of asynchronous motors. Our MOVITRAC® LTE-B frequency inverters are characterized by a compact range of functions, simple handling and quick integration into your application. They are available in three sizes for power ranges from 0.37 kW to 11 kW and line voltages of 115 V, 230 V and 400 V. Designed and developed for controlling the speed of asynchronous motors without an encoder, MOVITRAC® LTE-B reliably implements your simple handling applications. These basic inverters offer economic advantages, particularly in small, modular conveyor lines, and in fans and pumps. It is really simple: MOVITRAC® LTE-B lays the ideal foundation for controlling simple applications – in the field and in the control cabinet. The standard version of MOVITRAC® LTE-B for control cabinet installation is supplied with IP20 degree of protection. For field use, the MOVITRAC® LTE-B frequency inverter supplied with IP66- field housing is the right solution. Easy communication with all common fieldbus types; simply use DFx gateways. Ensures rapid implementation of your application thanks to adapted range of inverter functions. Can be easily selected: MOVITRAC® LTE-B in IP20 for control cabinet installation and in IP66 for field use. Approved in accordance with UL508, C22.2 no. 14.